Dhaka, 25 Dec, Abnews: This wizard barber in Pakistan flaunts 15 pairs of scissors simultaneously while giving a haircut to his clients, reports the Khaleej Times. 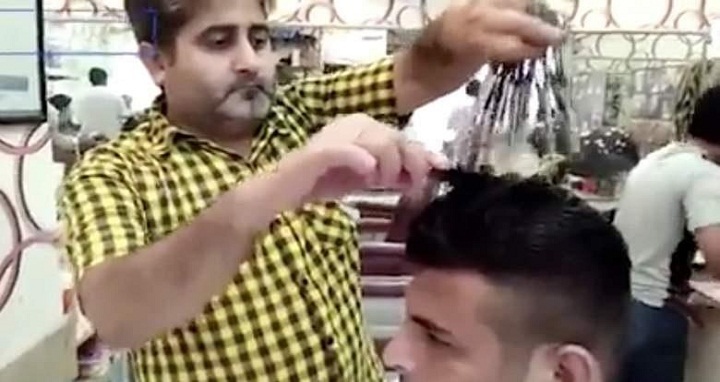 Sadiq Ali, in his thirties, takes not more than 20 minutes for each haircut and charges just US$2 for ‘the spicy haircut’, a name he has given for the cut. Ali runs a salon in Punjab, Pakistan, and is elite clientele list includes cricketers Umar Akmal, Sohail Tanvir, coach Mickey Arthur and Inzamam-ul-Haq, according to Pakistan Daily. ‘It took me at least five years to hone my skills. [The scissors] were heavy and it was difficult to make them work all at one time,’ Ali was quoted saying by Daily Mail. Ali has been into the profession for 15 years and was inspired by Chinese hairdresser Zedong Wang who set a Guinness world record in 2007 for using ten scissors together while giving a haircut.